Lifting and handling products manufactured by J D Neuhaus are engineered for performance, reliability and longevity when operating in extreme environments of dirt, dust, high humidity, and even potentially explosive atmospheres. Some of the toughest and more unusual conditions are currently experienced by today's underwater aquanauts. 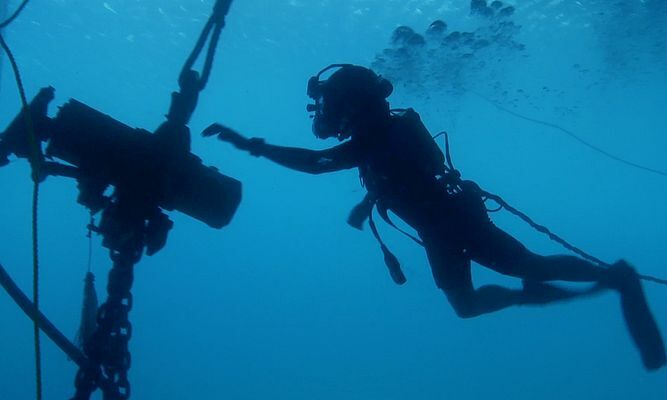 Divers are very often working alone, in conditions of variable depth water pressures and temperatures, combined with poor visibility while also battling with ocean currents. With all these problems to contend with, any tools they use need to be rugged, reliable, easy to operate and comply with the highest performance standards. The last few decades has seen unparalleled development in the field of oil and gas exploration, particularly offshore. JDN hoists have played their part in this market, offering hoists with lift capacities from 250kg up to 100 tonnes, with specialised units of 200 tonnes lift capacity having been supplied for BOP handling. The development of subsea hoists means that underwater as well as on-deck lifting operations for a wide range of operational, maintenance and repair functions can be undertaken on jack-up rigs, semi-submersible platforms, drill ships and FPSO vessels. Even undertaking underwater pipeline and wellhead operations down to levels of 70 metres can also be considered. 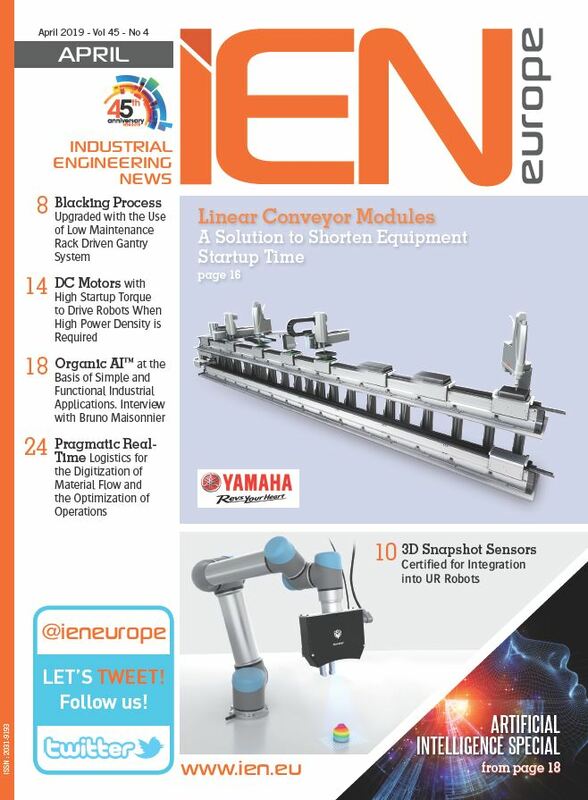 The proliferation of offshore wind farms and wave powered generation systems has also increased the potential requirements for suitable power tools that can be safely utilised underwater. Harbour locations often require underwater work, albeit not at great depths, while lakes, rivers, dams, reservoirs and bridge building operations can also have need for similar inspection, recovery or repair operations. The viability of JDN hoists in the underwater environment has been demonstrated when their air operated hoists were successfully utilised for the removal and replacement of a 50 ton rudder on a fully loaded bulk carrier vessel. After breakdown during a voyage from Brazil to China, the ship was first towed to a safe mooring off the coast of Venezuela, where the rudder removal and replacement work was undertaken. Three standard air operated JDN Profi 25 tonne capacity hoists were used in conjunction for this operation, with these units being subject to full rebuild procedures after the job completion. The work was successfully undertaken at sea, without the need for cargo removal or transfer. Subsequent to this exercise, the JDN company have introduced purpose designed hoists suitable for subsea operation, incorporating uprated performance and sealing features to withstand continuous underwater operation, even at depths of 70 metres. They can be supplied for either compressed air or hydraulic operation, utilising a diver-friendly pendant controller which is compatible with constricted, gloved-hand movements. This controller is connected by standard length 2 metre hoses to the hoist which ensures the aquanaut, hoist and load are all located within a close working environment. It is designed to ensure instantaneous and sensitive regulation of the hoist movements, providing infinitely variable speed of the load hook during both the raise and lower hoist operations. The need for voice instructions to/from a surface vessel or rig is obviated, eliminating potential delays or errors created through poor communications. Increased versatility is also provided by the fact that these hook-suspended hoists can also be safely utilised for both horizontal and oblique pulling operations when required. Overload protection is incorporated as standard to cover whatever type of underwater work is undertaken within the demanding inner space environment. The hoist lift chains provide a 3 metre raise/lower capacity as standard for variable load options of up to 3.2 or 6.4 tonnes respectively. 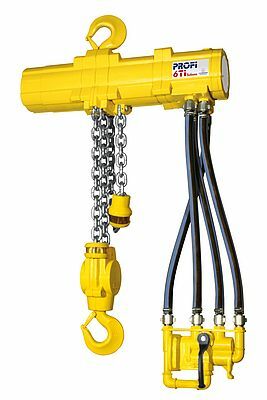 Variations on the length of lift chains or hose feeds to the pendant controller can also be changed for greater versatility. 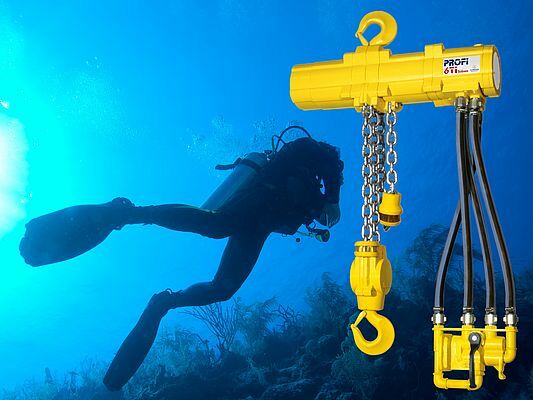 Hoists designed for higher or lower load limits, together with products capable of operating at depths greater than 70 metres could also be manufactured if required. The hoist construction utilises stainless steel for smaller exposed nuts and bolts together with valve heads, with grease packed covers fitted for larger fixings and wheel bearings. The remaining exposed metalwork is finished with three layers of traffic yellow RAL 1023 marine protective paint to a 300 micron dry thickness, as normally designated for offshore, salt laden operations. These purpose designed hoists can now successfully accommodate heavy duty, high performance operations with minimum maintenance or lubrication over extended periods of subsea operation. The fact that the hoist, diver operator and workpiece being manipulated are all retained within a regulated, visual distance ensures that maximum control and safety is maintained during difficult handling procedures.